If you're new here, you may want to get my Simple 7-Step Action Plan to Get Fresh Leads Daily For YOUR Business! To Download Now, CLICK HERE. Thanks for visiting! 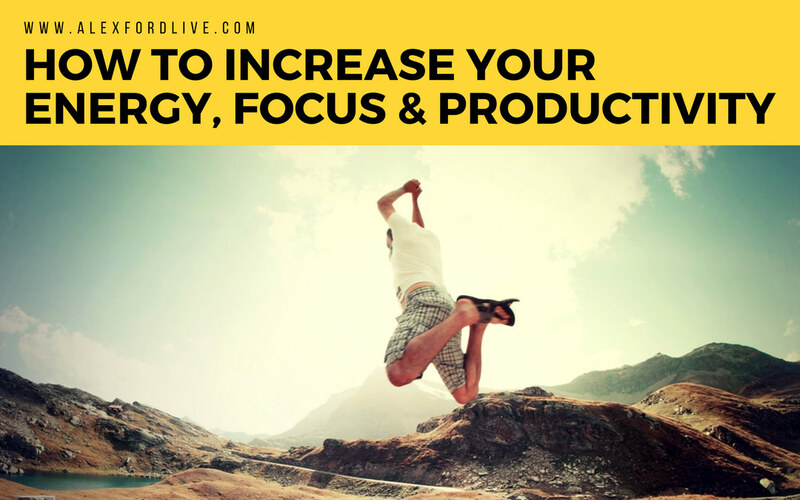 Are you looking for tips to increase your energy, focus and productivity so you can get greater results in your business? Do you find yourself checking your Facebook and emails so frequently that it throws off your productivity? In this post and video, I’m going to share with you some powerful success tips so you can increase your energy & focus, get more of your time back and increase your productivity 10X. But first, I have a confession to make… Just recently, and for a few years, I was addicted to checking Facebook and my emails. LOL. Yes, that’s right. I was a sucker for it! In fact, it was all due to being a sucker for helping people. Let me explain. My business has been growing so fast the last few years, a lot of new members have been signing up into my organisation, that the amount of messages and emails I was receiving had gone through the roof. And, because I’m a sucker for helping people, I was often finding myself replying to emails and messages ALL THE FREAKING TIME. Yes, it’s great to be personally helping people, but because of my previous habit of offering one-on-one support to everyone, all the time, I was often finding myself spending weeks at a time ONLY replying to people and supporting them over the phone. When I’d spend a whole week at a time working only on other people’s businesses, my energy & focus went through the floor; and my productivity & motivation took a huge hit because I wasn’t working on income producing activities in my business. Have you ever felt like you’ve spent too much time, maybe not supporting others, but replying to emails, Facebook messages, scrolling through your newsfeed, and other things that aren’t income producing activities? Click Here To Download My Proven 7-Step D.M.O. 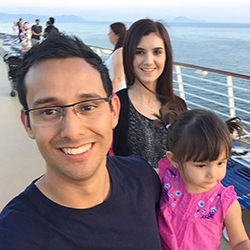 To Get More Leads, Sales & Sign-Ups, And Grow Your Business To $10K/Mo On Social Media! Well, it was important for me to break the pattern once and for all. And when I did it, it was one of the best things I could have done. In fact, just by doing this, I realised I was super present with my family during off-work periods, which really lit my family up but also lit me up. Previously, I’d be out with my family, but I’d be constantly checking my Facebook and reply to messages. I wasn’t really there with them. I mention this because if you make time to be with your family, and you’re 100% there with them, you are going to feel so much better, not just while you’re with them, but when you’re at work too. Remember, you’re building a business for TIME FREEDOM, not to take on even more work than your current job – or previous job, if you're work for yourself full time. So make sure you’re taking real time off to spend with your family and do enjoyable things. So my new strategy now is: Don’t check my phone when I’m with my family – at all. What happens as soon as you check your messages is that everyone else’s agenda enters your mind. For example, their questions, comments, problems and requests. When you do this, you’ll be thinking about it all during your morning routine – what should be YOUR time, not everyone else’s time. And, instead of focusing on setting yourself up for the day, you’ll be feeling like you have to respond to everyone else. So instead, set specific times to check your email and Facebook. For example, if you check them at 11am, you’ll feel great because you got to spend some “YOU time” and were also super productive in the morning. Then you can check your messages again at 4pm, which again frees you up so much more time to be productive. If you want to as well, you can check your messages at 8 or 9pm, once the kids go to sleep and you’ve spend time with your spouse. But the key is: Set specific block times to check your messages and spend the same amount of time checking them each time. For example, 30 mins per block time. 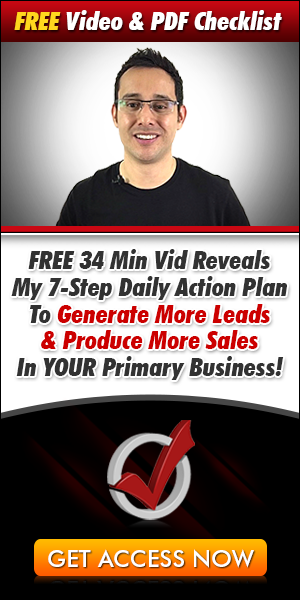 [FREE Video + Checklist] Download My Proven 7-Step Daily Action Plan To Generate More Leads & Produce More Sales In YOUR Primary Business + The 7 Core Things You Need To Focus On Every Day To Build A $10K/Mo Business On Social Media… Click Here To Download Now! I learned this one from the book “Eat That Frog” by Brian Tracy. This basically means that once you’ve completed your morning routine, which could be exercising, reading, meditating, eating well, and feeling great; you’ll now be super focused and can work on getting the biggest task in your day out of the way. This is important because by the time 11am comes, when you check your emails and Facebook, you’ll be feeling amazing because you had a huge win already. This is common sense, but common sense isn’t so common these days anymore; so it must be said. The purpose of this is so you can be 100% present with your family. When you do this, you’ll enjoy your weekends more and when the work week comes around, you’ll feel amazing because you poured your heart into your family. Nothing is worse that going through your week and feeling a negative vibe because your spouse and kids really miss you. Trust me, I’ve been there. There you go! If you implement these simple tips into your life and business, your energy, focus and productivity will go through the roof. Now it’s just up to you to take action and see the difference these tips make in your life. If you enjoyed this Energy, Focus and Productivity Tips post, feel free to share. You’re welcome Sarah! Thanks for stopping by.